Part of the first generation of African-Americans born free in the post-Civil War, Alice Dunbar Nelson was a poet, journalist, and activist. 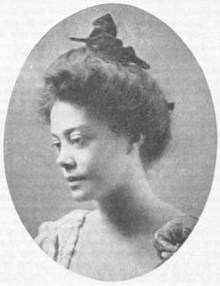 Part of the Harlem Renaissance, Nelson published her first collection of short stories, Violet and Other Tales (1895), which included A Carnival Jangle and Little Miss Sophie. Dunbar-Nelson taught for a decade at Howard High School in Wilmington, Delaware, becoming a strident political activist in the 1920's and 1930's in the women's suffrage movement, leveraging her talents and beliefs as a political columnist and public speaker. In 1898, Dunbar-Nelson married first generation free African American, author and dialect poet, Paul Laurence Dunbar. Visit American History and the African American Library for other important historical documents and figures which helped shape America.